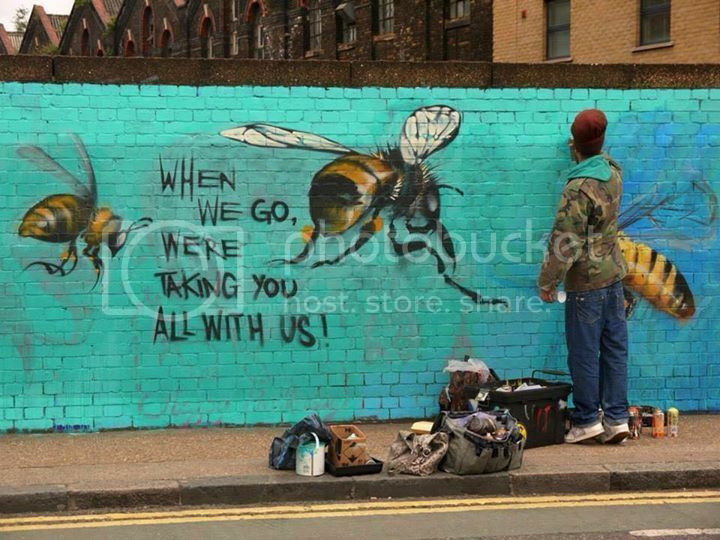 Interestng, I can;t recall seeing any bees at this time of the year. We have a couple of mild weather days, maybe they knew? Certainly seems to be more bird song today. 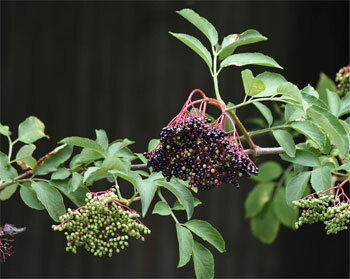 Richard wrote: Interestng, I can;t recall seeing any bees at this time of the year. Neither have I in the past to be honest. I think the hive will be down to something like 8,000 bees now and there were just a few flying yesterday. I would say yesterday there were in the order of tens flying in and out at a time, compared with hundreds in the summer. So given they fly over a wide area the chances of spotting one of them would be quite small. Despite temperatures down to minus 18 a few weeks ago, we have been surprised at how busy our bees have been on the few mild days we have had lately. Unfortunately the kitten also found out that a dozy bee can sting if you play with it. Lesson learned. The bees were going for the chicken food as they did last year but OH has started to give them syrup. He says they are doing housework and need the energy. I bought an additional hive this week. A company called Thorne has a special offer 'bees on a budget', where you get just about everything you need to set up a hive (http://www.thorne.co.uk/hives-and-bees/bees-on-a-budget/bees-on-a-budget-kits?product_id=197) for £150.00. However, in addition you'll need a smoker, a bee suit, gloves, hive tool, etc. so not exactly cheap to get into. The reason for the second hive is that, assuming my colony had survived the winter with the queen (I know the colony is full of bees but that is no guarantee the queen is OK) there is every likelihood that my colony will want to swarm. That is where hive number two comes in, I will try to trick the bees into thinking that half of them have swarmed into a new hive. I'll post more about this in the spring/early summer, if and when it happens. In the meantime, I have signed up for an intermediate beekeeping course with our local beekeepers' association. I'll take photos and write up each week and post details here. Although I have noticed the odd bee out and about before now, yesterday I actually saw a few bees coming back with their pollen baskets full. Given there is little else in flower at the moment, I am guessing that they are collecting crocus pollen. Given that there were only a few bees out and each bees collects only a tiny amount of pollen, i it can't be enough to keep the colony feed but as they say every little counts. The weather is still a bit changeable, but Spring is just around the corner. The queen should be laying again now which means the colony needs plenty of food to feed the new bees that are being raised. When the weather is warm, the bees are out collecting pollen, which is a good sign that the queen is laying, as the bees like to feed new brood fresh, rather than stored pollen. The possible problem is that the winter does are very low and there is a danger that the colony will starve. So, I ordered some bee fondant from a specialist bee supplier on the internet. It is very similar to the fondant you get on iced buns. I will put this in the hive this weekend. Hopefully, this will keep them going. I will do the first proper inspection in a few weeks time when Spring is truly here. I have been inspecting the hive every week for the part few weeks and to my novice eye all is looking good. The queen is laying well and i can see lots of healthy brood. What is interesting/worrying is that I can now see they are building queen cups. These are much larger cells than they use for normal brood and when the queen lays in these, the workers feed the developing larva royal jelly, which promotes the development the of new queens. And, once new queens are on the way, the old queen will swarm off with half the bees, basically, all the flying worker bees, leaving behind the new queen and the nursery bees. I don't think they are quite on the point of swarming yet but it's the time to prepare to do an artificial swarm. I'll update next week, with a few photos. Sounds a bit scary to me Michael !! Durham Beekeepers meet the last Wednesday of every month. Couple of things I took away from tonight was (1) be prepared for your swarm control now (I think I am as I have my spare hive all set up and ready in place) and (2) I must buy a queen cage so that when I spot her I can cage her as I do the Pagden colony split. This months National Geographical magazine, besides featuring a great article on dolphins, also as a feature about the search for a 'super' bee; one resistant to diseases, good tempered, good honey producer, etc. One of the interesting, perhaps worrying things, is the scale of beekeeping in the USA. California grows 80% of the world's almond production, worth $2.8 billion per year over an area of 1.7 million pollinated acres. Because it is grown as a 'mono-culture' and the almond is only in blossom for 3 weeks, they need to ship in each year, 1.6 million bee hives. These are brought in on articulated lorries carrying hundreds of hive each from specialist bee farms who rent their hives out to the almond farmers. At the end of the 3 weeks, the almond blossom is gone and the bees would just starve to death in this almond-only, unnatural environment, so they are all packed up again and shifted round the country to pollinate the apples, sunflowers, melons, etc. Whilst it is interesting, at the same time I find it scary; no wonder the poor bees have succumbed to all sorts of pests and diseases, and because even kept bees are still wild animals, these diseases have spread to the feral population and then throughout the world. In fact, it is claimed that in this country, probably the same for the USA and Europe, we no longer have any feral, wild honey bees. One guy in the article states that at one point "you had bees", in other words they more or less looked after themselves. Now a days, we are not bees keepers, we have become disease managers. My last couple of inspections did indicate that the colony was preparing to swarm. They were build 'queen cups' and then last week I saw they were raising new queens. My problem was at the time I couldn't find the existing queen to move her to a new hive. So I looked online at Barnsley Beekeepers' website where there was a half decent article on what to do if the the colony is about to swarm and you can't find the queen. I did what they suggested but one of my hives still swarmed this morning. 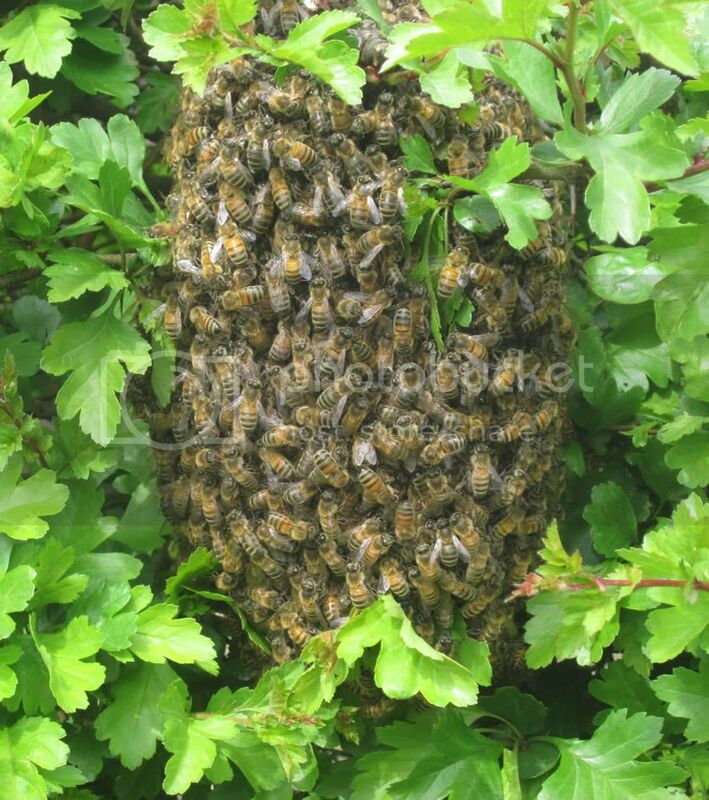 I got a call at work at lunchtime from my son at home, telling me there was a swarm in the hawthorn hedge. So I came home, captured the swarm into a nucleus box and they seem happy enough. Whole process only took 10 minutes. My swarm has settled into their nucleus box nicely. Bees are out flying and bringing back plenty of pollen and presumably nectar. The next step will be to inspect the nucleus box and the hive early next week. Hopefully, the hive they swarmed from will have a new queen that either I can locate or at least see evidence of her laying. If not, there is a chance she hasn't made it back from her mating flight, in which case, I will have to re-introduce the swarm back to the old hive. Fascinating stuff. 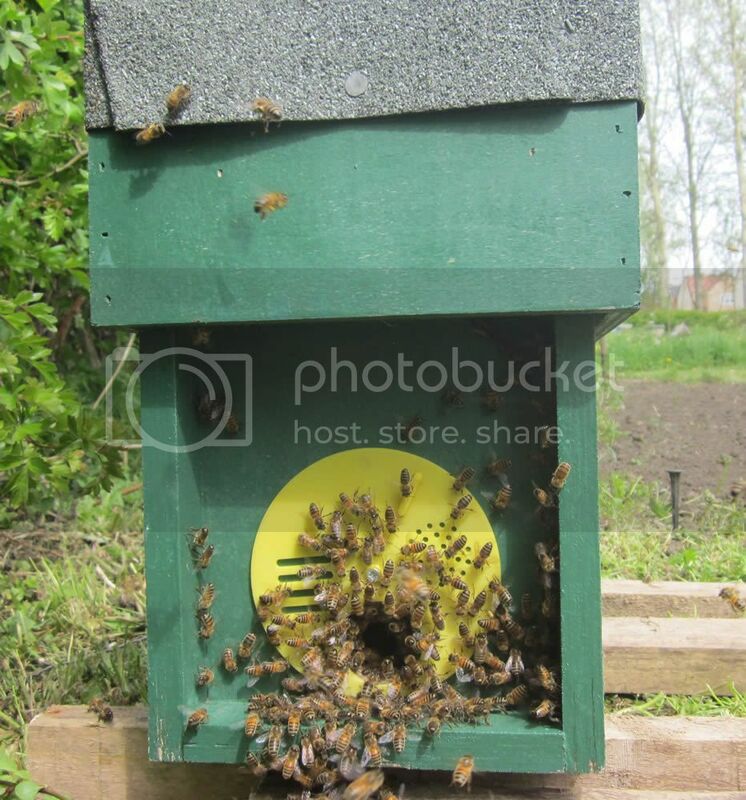 I didn't realise industrial bee keeping was possible, it seems so unnatural (and it is!) Surely a monocrop like that can't be good for any of the local wildlife - biodiversity is what nature does best after all, even down to the vegetation growing underneath. Fingers crossed your new queen takes. What will you do next year when they swarm again? Just noticed the entrance to the 'new home' in the picture above. Interesting. I seem to remember having a bar of wood that you had to prise out and turn through 90 degrees if you wanted to shut them in. Are the slots a queen excluder?